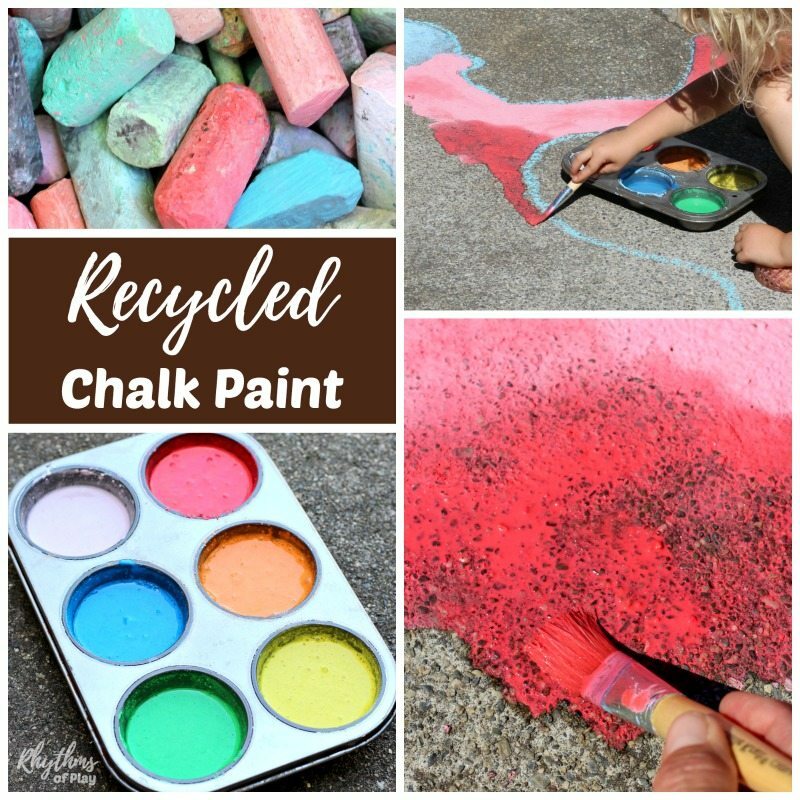 Making recycled chalk paint for outdoor art is a great way to re-use and recycle small and broken and water soaked pieces of sidewalk chalk. Kids love painting with DIY chalk paint… chalk paint is the perfect medium for outdoor process art that can easily be washed away. 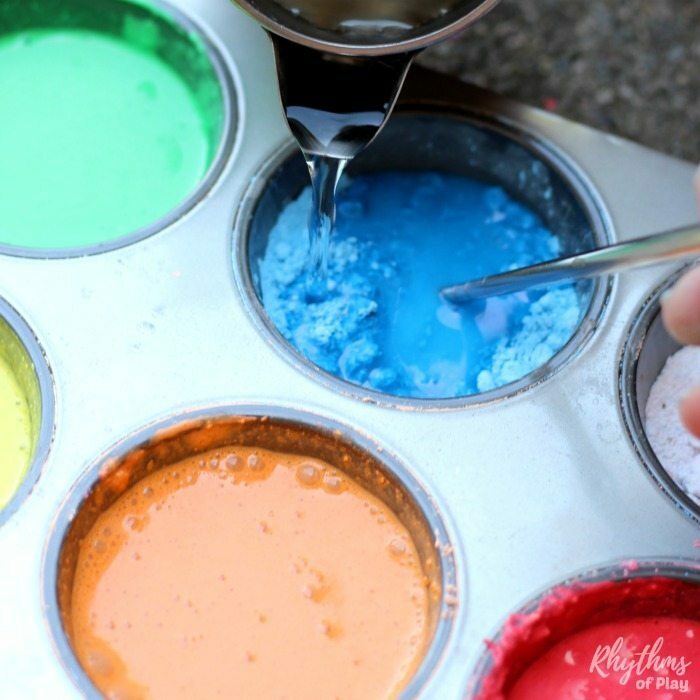 Have your children collect old pieces of chalk to make their own DIY chalk paint today! My daughter and I LOVED painting with our recycled DIY chalk paint. It’s the perfect medium for outdoor process art that can be easily washed away! We used our shadows and chalk paint to create shadow art on our driveway. It was like painting with dusty watercolors on a huge canvas. 1. Collect broken chalk and sort by color. This is a great color sorting activity for kids! 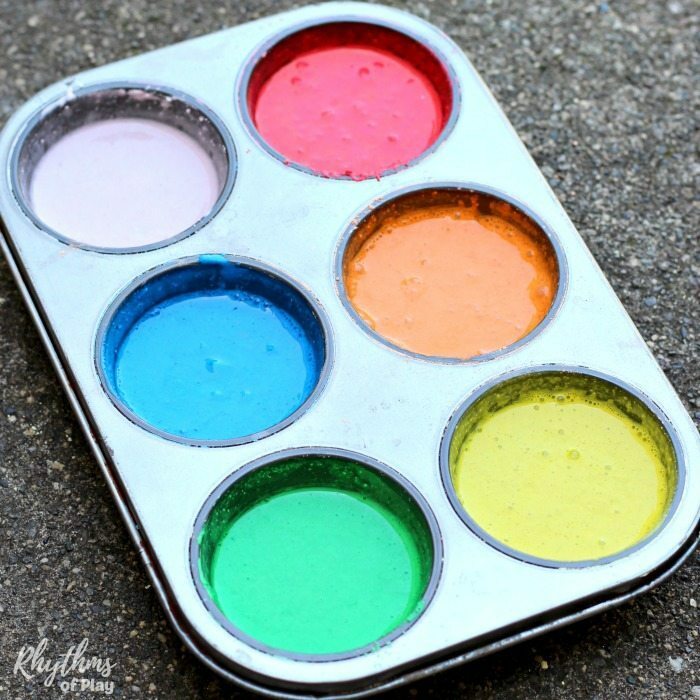 Have your kids collect old broken pieces of chalk out of your chalk bin and sort them into a muffin tin or other containers. 2. Place each color of broken sidewalk chalk in a separate freezer bag. 3. Wrap the bag in a towel and use a rubber mallet or a hammer to gently crush the sidewalk chalk into a fine powder. 4. 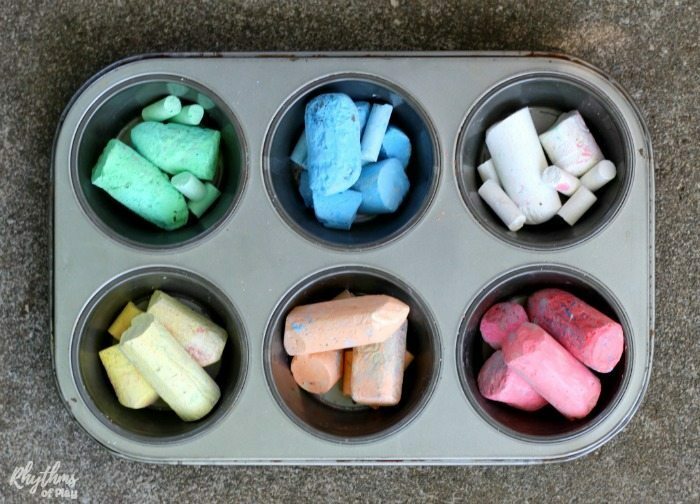 Add powdered chalk to a muffin tin or another container–one color per compartment. 5. Add water to chalk powder and mix. Slowly pour water into the chalk powder one color at a time. Mix with a chopstick while pouring slowly. You want your DIY chalk paint to be the consistency of pancake batter. 6. Allow recycled DIY chalk paint to sit and settle for 30-60 minutes before painting with it. Note: When using DIY chalk paint you will need to have water available to continue to add to the paint. The powder gets think as you use the chalk paint and continuously needs more water. We kept a little metal pitcher near where we worked to easily add water whenever out paint started getting a little dry. 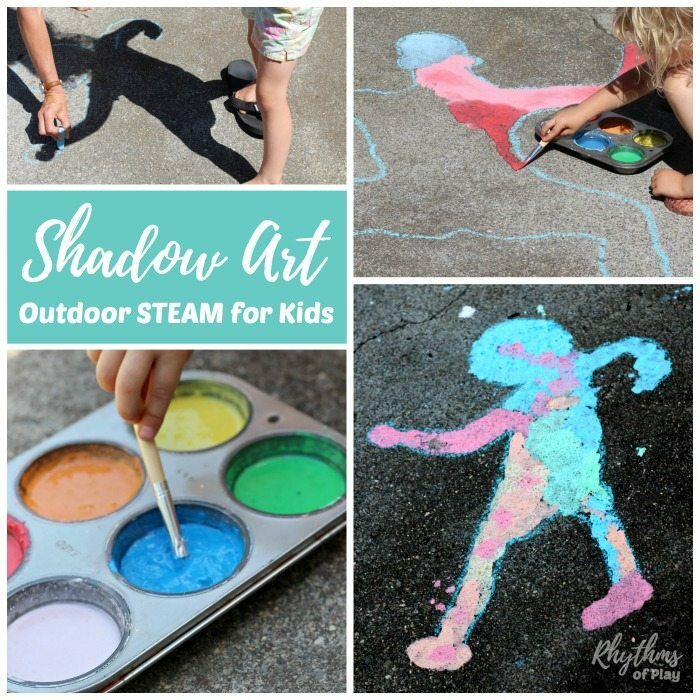 We used our chalk paint to make shadow art on our driveway–a fun hands-on outdoor STEAM activity. My daughter and I LOVED working with chalk paint. It was like working with dusty watercolors on a giant canvas. The colors look a bit paler in color when they are wet than when they are dry. Any little chunks left in the paint can be easily crushed with the handle of a paintbrush and mixed in. I don’t recommend using this paint on an outdoor chalkboard because it runs. It is best to use on flat surfaces like driveways, sidewalks, and playgrounds. Making recycled chalk paint is a great way to recycle old broken and water soaked pieces of sidewalk chalk. Chalk paint is the perfect medium for outdoor process art that can easily be washed away. The vibrant colors look beautiful painted on sidewalks and driveways. For more summer fun be sure to check out our summer bucket list seasonal activity guide. You may also like our arts and crafts page for kids with lots of other creative ideas to try.